Four Steps to Gorgeous Skin…and at 25% Off! Eight Skincare 4-Step Skin Rejuvenation Kit pampers the skin and the senses, bringing dull, dry skin back to life. It’s a luscious and healing treatment that unveils the softest skin texture possible, in addition to restoring balance and protecting. The brand’s name is derived from the eight ingredients that are used in the formula, all of which are culled from nature and are the richest and most beneficial for skin: Aloe Vera, Argan Oil, Monoi Oil, Evening Primrose Oil, Vitamin E Oil, Jojoba Oil, Avocado Oil and Apricot Kernel Oil. 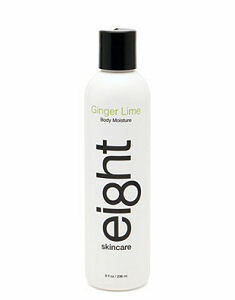 Eight’s goal is to restore the health and beauty of the skin, in gentle and natural ways. We can get down with that noble, worthwhile goal. Eight key ingredients + four steps = skin nirvana. Follow this step-by-step regimen to achieve baby soft, healthy skin. Ultimately, you only have one skin and it’s the largest organ of your body. So what’s five minutes of commitment time in order to implement Eight into your routine? Simply, Scrub + cleanse + exfoliate + moisturize = gorgeous skin, year-round. Do the math – it’s worth it. Here are the four steps. Start by dry brushing your top layer of skin with an apparatus that looks….well…. intimidating. But trust us — it’s not. The Natural Sisal Brush removes the outermost layer of dead skin cells and cleanses pores, which allows the products to work in concert to effectively do their job. Plus, the dry brushing wakes you up, stimulates circulation and gets blood flowing. I felt instantly more awake and invigorated after running the brush up and down my arms and legs a few times before stepping into the shower. In the shower lather up with the Eight Creme Body Wash, which cleans, smoothes and moisturizes, not to mention fills your bathroom with a fresh and crisp aroma. The Ginger Lime scent is luxe and divinely fragrant, but never overpowering. 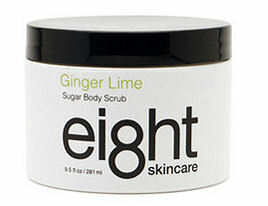 The ultra rich Eight Sugar Body Scrub further removes dead cells and moisturizes. Bye bye, lifeless skin cells. 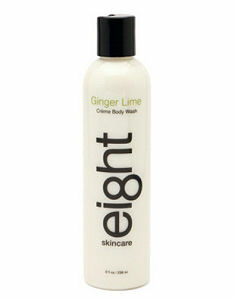 After showering, slather on the Eight Body Moisture. The lightly-scented lotion adds yet another layer of moisture, so seriously, don’t fret about the dry brushing! As a result, skin is soft, soft and soft. And it smells fresh, too. Along with Ginger Lime, choose from Tangerine Dream or Lavender. Additionally, we’re offering the kit at a 25 percent discount! The Eight Skincare 4-Step Skin Rejuvenation Kit is perfect for brides looking to give a gift that keeps on giving to their loyal and lovely bridesmaids…and a great gift for the groomsmen too. Eight Skincare is great for both men and women. To get the discount, click on the ad at the top right, and use the code BeautyNews25. Also, with the holiday season right around the corner, why not start your shopping early? Stock up. Gift your gal or guy pals with a luxe skin treatment that they will love, love, love without breaking your bank! While you are at it, why not treat yourself and your skin to the kit? You deserve it. I just had the good fortune of receiving some wonderful products from the company called eight. I used the body brush first which prepared my skin for the ginger lime body wash. It smells divine, like being in the very best spa! I then used the body moisture which made my skin feel literally like silk. I have very sensitive skin, the fact that these products feel so soothing proves to me that they are made with the finest of ingredients. I plan to order some more products in the next few days, and I will do what I always do when I find new beauty products that I love- Call all the girlfriends!!! !